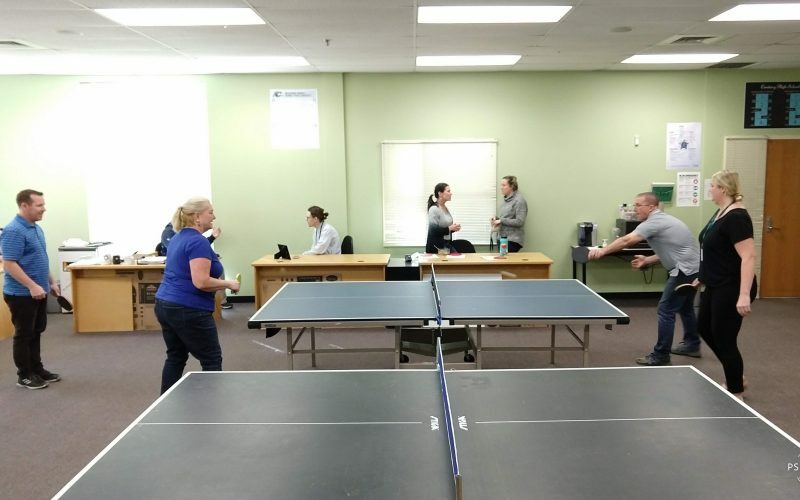 “We play for bragging rights in the office and it is a fun lunch time atmosphere that can break up and give us an opportunity to not think about classes for a brief amount of time,” says Mr. Bunting, one of the teachers that regularly participates in the tournaments. During the lunch period, some days are competitive and on other days there are different events. One of the events is Mixed Mondays. During this event, it is a combination of male and female teams and they play against each other. Right now, they are in a round-robin phase, which is everyone playing everyone to figure out the standings. Another event that they do is 3 for Thursday. This is when there are teams of 3 playing against each other. The leaderboard has been revealed for this one. Right now, Conner, Hainline, and Dunn are doing the best in this event with 7 wins and 1 out. And finally, there are single ping pong tournaments. This is where some of the competitive people will play. They tend to be the people that have been here longer and have more experience.. Some of the regular competitors are Conner, Christianson, Rogers, Bunting, and Dunn. These teachers are competitive and talented. There are more teachers, but they participate in the other less competitive events. The more experienced players (the ones in the single ping pong tournaments) use their non-dominant hands during those events. Everyone else uses their dominant hand, so this way, the people that aren’t as experienced have a better chance. The scoring system for ping pong is rally. If it is failed to be returned or the other team hits it into the net, then you get the point. If you launch it over the table, then the other team gets the point. The first side to get 21 points wins the game. 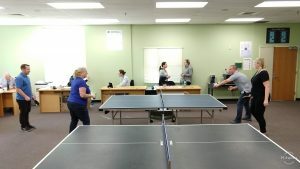 Unfortunately, the ping pong tournaments are only for teachers, so no students are allowed to be in there witnessing the teachers. It is there break time and gives the teachers to unwind/destress during the 30 minute break. Let’s wish this year’s contenders to have good luck and to win those bragging rights.